Launched aboard a Japanese H-2A rocket on Dec. 3, 2014, Hayabusa 2 is Japan’s second space mission dedicated to bringing samples from an asteroid back to Earth. 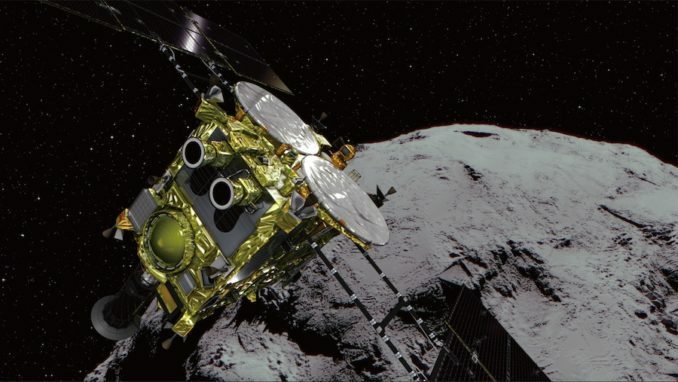 The mission’s predecessor, named Hayabusa, returned microscopic specimens from asteroid Itokawa in 2010 after a series of malfunctions prevented it from capturing the planned amount of material. “Hayabusa was a technological demonstrator, so its main purpose was technology and the second purpose is science,” said Makoto Yoshikawa, Hayabusa 2’s mission manager at the Japan Aerospace Exploration Agency, in a phone interview last week with Spaceflight Now. “For Hayabusa 2, science is the main purpose. That’s a big difference. Scientists have noticed crater-like recessed landforms around Ryugu, including one that seems to measure more than 600 feet (200 meters) in diameter. After the initial survey, Japanese scientists will decide in August where to send Hayabusa 2 to collect the first of three samples from Ryugu. The mission’s first touch-and-go landing on Ryugu is set for September or October. The OSIRIS-REx spacecraft is set to arrive in the vicinity of Bennu around Dec. 3, but the mission’s ground team will spend a year investigating the asteroid before going in for a sample collection in July 2020, with the specimens set to return to Earth in 2023. “They’re going a lot more quickly than we are,” Lauretta said. “We’re not going to be making a sample site selection until more than a year from now. So we’re going to map and map, and think and process and analyze. They’re going to go in and have a site selected by mid-August, less than two months from now. That’s a very different approach to the issue. I’m curious and excited to see how they go about that. One of the three samples to be collected by Hayabusa 2 will come from material excavated from beneath the asteroid’s surface. Hayabusa 2 will use explosives to fire a copper impactor into the asteroid to carve an artificial crater, exposing underground pristine rocks for the probe to pick up during a touch-and-go maneuver. We are now only a short distance from asteroid Ryugu! On February 26, 2018, an image of Ryugu was successfully captured using the Optical Navigation Camera - Telescopic (ONC-T) onboard Hayabusa2 (story and images here). Although the asteroid can currently only be seen as a bright point, it is very encouraging for the Hayabusa2 Project Members to spot the destination! Nobody yet knows what Ryugu will look like. Even the Hayabusa2 Project Members and experts from all around the world do not know! This is why we are hosting a contest to ask you all to imagine what Ryugu will be like before Hayabusa2 arrives at the asteroid. But what do we already know about Ryugu, and why is it so hard to know what it looks like? Here I will summarise what you might find helpful when picturing Ryugu. Note: This explanation is quite long and sometimes a bit technical. For imagining what Ryugu will look like, it may be better not to have your ideas tangled up in all this information! So if you find this a tricky read, feel free to just skip to the last summary. Why can't we see what asteroids look like? The reason we do not yet understand Ryugu is because asteroids appear only as points even when viewed with a large telescope. This may seem a little strange! How are we able to see the shape of a galaxy tens of millions or even billions of light years away, but we do not know the shape of celestial bodies within our Solar System? Actually, a quick calculation can show you why this is true. Let's consider an asteroid with size 1 km at the same distance as the Moon, which is about 380,000 km from the Earth. The apparent size (how big it looks to us on Earth) is about 0.5 "arc seconds" or arcsec, which is the size of the angle the asteroid fills on the sky. An angle of 1 second is 1/3600 of a degree, so 0.5 arcsec covers just half that on the sky! Even to large ground-based telescopes (telescopes here on Earth rather than in space), such a small size looks like a point, even when the asteroid is as close as the Moon. Normally, asteroids are much further away than the Moon so they become even smaller points. For comparison, the diameter of the Moon is about 3,500 km, which is about 0.5 degrees (30 minutes or 1800 arcsec) when seen from Earth. The elliptical galaxy, M87, in the Virgo Cluster of galaxies, is a staggering 60 million light years away, but the galaxy is very big and has an apparent size of about 7 minutes (420 arcsec). This is big enough to see the galaxy's shape through a telescope. How can we know the shape of an asteroid? So how can we know the shape of an asteroid without travelling much closer? There are two different methods for deciphering the shape at a distance. 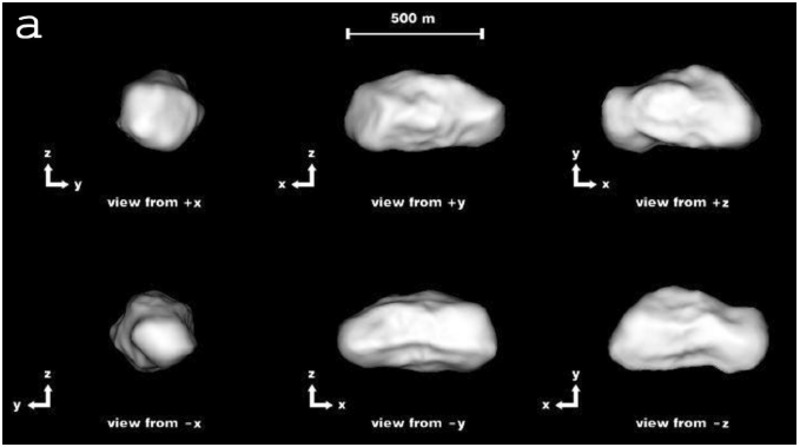 The first is to estimate the shape by examining changes to the asteroid’s brightness. Asteroids are bright because they reflect sunlight. Like the Earth, they also rotate on their own axes (they spin). If the asteroid's shape is irregular, the brightness changes as the asteroid rotates and different parts of its body come into view. This data from the change in brightness is called a "light curve" (or "light intensity curve"). By acquiring many light curves, information about the asteroid's rotation (such as the rotation rate and orientation of the rotation axis (direction of spin)) and the shape of the asteroid can be found. The second method for finding the shape uses radar. As an example of how shape-finding works, let's look at the asteroid explored by Hayabusa; the predecessor of Hayabusa2. This was asteroid Itokawa. Itokawa originally had the moniker "1998 SF36" before it was named "Itokawa". We call this code name the "provisional designation" of an asteroid. Although we will not unpick the full meaning of the provisional designation here, the "1998" is easily understood as it refers to the year of discovery. The asteroid explorer, Hayabusa, also had a code name and was called "MUSES-C" before launch. Many observations of 1998 SF36 were made once the asteroid was chosen as the destination for MUSES-C and one important one was the observation of the light curve. The horizontal axis is called the rotation phase and covers one complete rotation. The vertical axis is the relative value of the asteroid's brightness. "Relative value" means the exact value on the vertical axis does not mean anything. Instead, you should look at the amount of change in the brightness. Once asteroid 1998 SF36 was destined to be the celestial body explored by MUSES-C it became the focus of an intensive observational campaign. The light curve shown in the figure above is from the early days of these observations. From this light curve, we could see that the asteroid takes about 12 hours to rotate once. 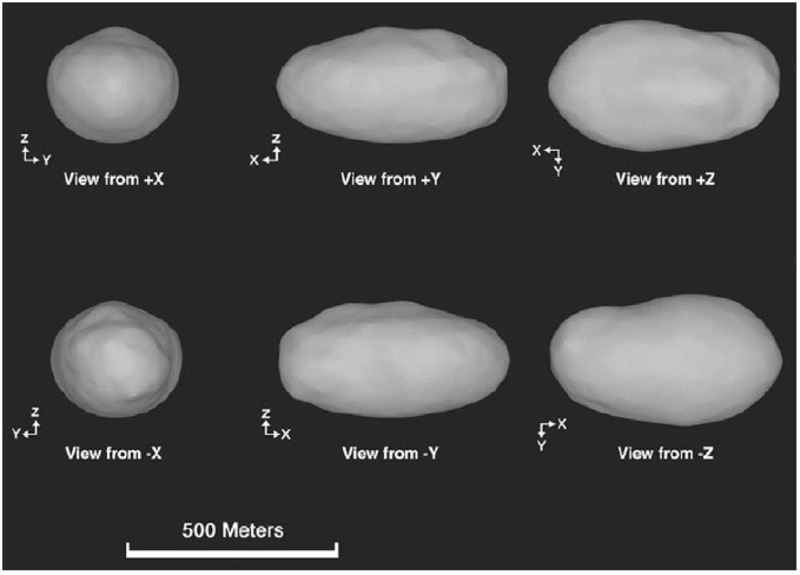 We could also estimate the asteroid shape, shown in the figure below. The light curve revealed the asteroid has a slender shape, but no further details. We therefore followed up with radar observations. Radar observations reflect radio waves off the surface of the asteroid. This is exactly the same principal as the radar used in air traffic control. The difference is that the asteroid distance is very far. Strong radio waves therefore need to be emitted, and the reflected wave is very weak, so a large antenna is needed to receive them. For radar observations of asteroids, radio waves are transmitted from a parabolic antenna with a diameter of 70 m which is situated in Goldstone, California in the US. They are received the 305-m-diameter antenna at the Arecibo Observatory in Puerto Rico. The first radar observations of 1998 SF36 were conducted from March to April 2001. At this time, the asteroid was 0.038 astronomical units (1 astronomical unit is the distance from the Earth to the Sun) from the Earth, which is about 5.7 million km. Figure 3 shows the shape of 1998 SF36 from this data. The shape of 1998 SF35 estimated from radar observations performed from March–April, 2001. After these observations, MUSES-C was launched on May 9th, 2003. Once the successful launch was confirmed, the spacecraft was named "Hayabusa". The asteroid 1998 SF36 was named "Itokawa" in August 2003, after Dr. Hideo Itokawa, who is known as the father of Japanese rocket development. Since 1998 SF36 was discovered by the LINEAR project in the USA, they had the right to propose a name. But the Hayabusa Project asked LINEAR to propose the name Itokawa, which was then recognized by the International Astronomical Union (IAU). It was possible to observe Itokawa again by radar before Hayabusa arrived. This was done on June 2004, when Itokawa was 0.013 astronomical units (about 2 million km) from the Earth. The shape estimation from this set of observations is shown below. Hayabusa reached Itokawa in September 2005, so the radar data in the figure above was obtained before arrival. This meant we had a considerable amount of information about the asteroid before we arrived. However, we did not know about the state of the asteroid's surface. When Hayabusa arrived, the craters in the radar data became visible. The surface of Itokawa was full of irregularities and everyone was surprised! In the shape model figures above, we could see the shape of the asteroid steadily improve and become more accurate. But when comparing with the real image of Itokawa, it is not an overstatement to say it is really quite different from what we expected! There is also the example of comet 67P/Churyumov–Gerasimenko, which was the destination of the Rosetta spacecraft, launched by the European Space Agency (ESA) in 2004. In this case, the comet was observed by the Hubble Space Telescope and its shape was estimated as shown below. 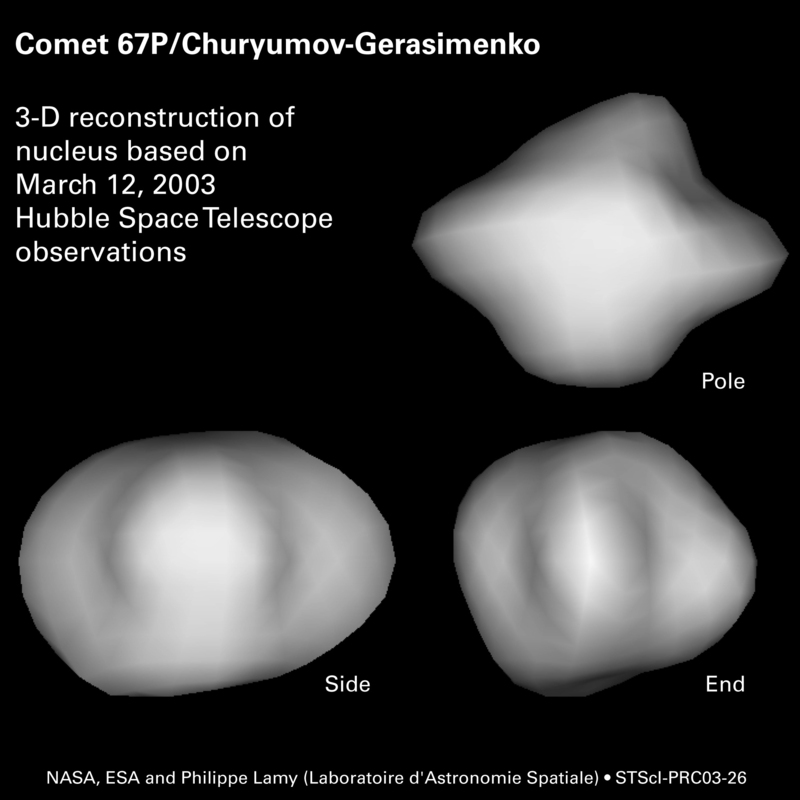 The shape of comet 67P/ Churyumov–Gerasimenko, estimated by data from the Hubble Space Telescope in March 2003. 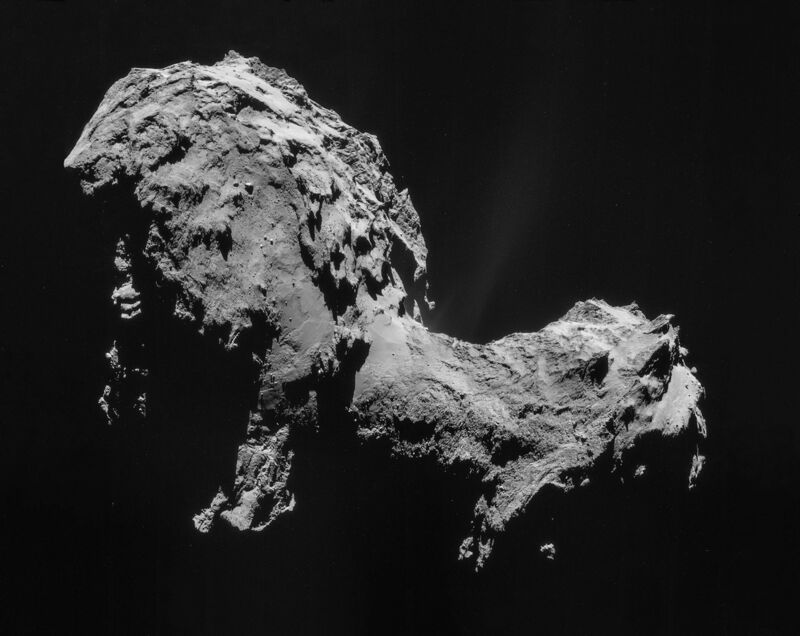 Yet this is not the shape of the comet that Rosetta found when it arrived at 67P/Churyumov–Gerasimenko in 2014. The figure below shows the actual comet. Comet 67P/Churyumov–Gerasimenko, as seen by the Rosetta probe. 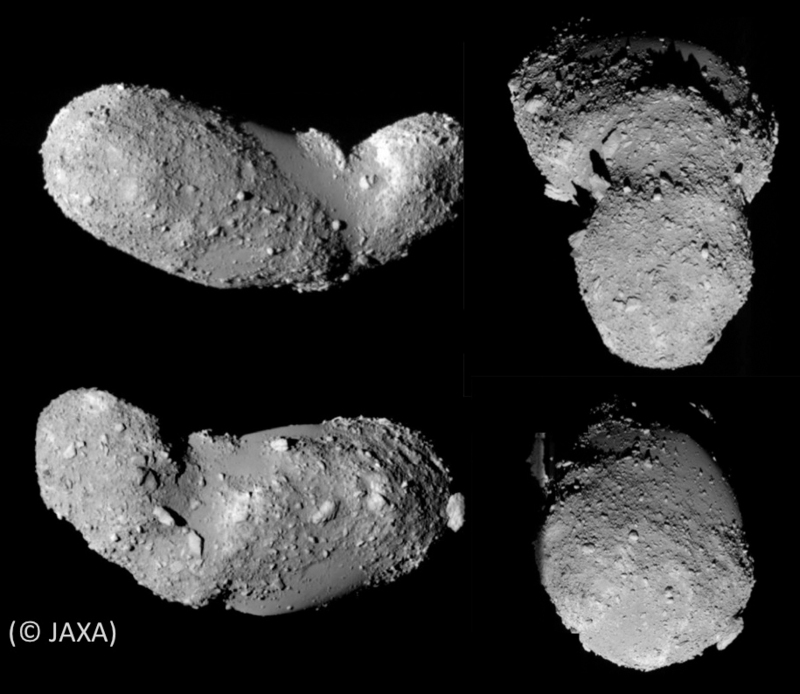 From the examples of Itokawa and 67P/Churyumov–Gerasimenko, you can see that the presumed shape from Earth is quite different from the actual celestial body! So what about asteroid Ryugu that Hayabusa2 will explore? Below, we will take a look at what is currently known about Ryugu, but please remember that we will not know Ryugu's true appearance until Hayabusa2 arrives. So use your full imagination when entering the contest! As we summarize what we know, try and picture Ryugu...and if you do not read the information below, you may still imagine the asteroid more accurately! Asteroid Ryugu was discovered by the US LINEAR project on May 10th, 1999; the same project that discovered Itokawa. The provisional designation for the asteroid was 1999 JU3, with the permanent number 162173 assigned once the asteroid's orbit was accurately estimated. 1999 JU3 was on a list of prospective candidate destinations from 2006, when the Hayabusa2 mission was first proposed. The asteroid gained the name "Ryugu" in September 2015, nearly a year after Hayabusa2 was successfully launched in December 2014. The name was selected in a contest organized by JAXA, and is taken from the Japanese folk tale of Urashima Taro. In the tale, Urashima was a fisherman who rescues a turtle from a group of children. The turtle brings Urashima to an underwater palace known as "Ryugu" or "Dragon's Palace". He falls in love with a princess who begs him to stay, but after three days Urashima wishes to return to the surface. As a parting gift, the princess gives Urashima a box that she tells him never to open. Upon returning home, Urashima is shocked to find that 300 years have passed and everyone he knew has died. In confusion, he opens the box and is encased in a cloud of white fog. When the fog clears, he finds he is an old man, as the box contained his age. Hayabusa2 is travelling to an asteroid that we believe has not changed greatly since the Solar System was formed. So while Urashima found his lost past in a box from Ryugu, Hayabusa2 will bring from asteroid Ryugu a box containing a sample from the lost past of our Solar System. The name was officially assigned after the proposal to the International Astronomical Union by the LINEAR project. 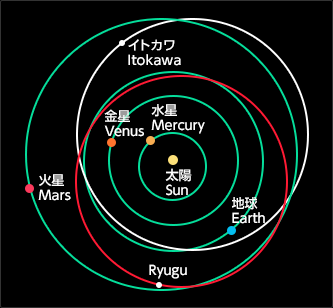 The orbit of Ryugu is similar to that of Itokawa and takes the asteroid between the Earth and Mars as shown below. Once you know the orbit, the size of the asteroid is the next concern. You might think that size can be estimated from the observed brightness. Since we know the orbit of Ryugu, we know its distance from the Earth during observations. Therefore, it might seem the size can be linked to the observed brightness. But this way does not work! The problem is that we do not know how much light the asteroid surface will reflect. For example, if Ryugu is a dark asteroid, then it will reflect very little light, but if it is closer to white, then the surface will reflect light well. This reflectance is called the "albedo". If the albedo is unknown, we cannot estimate the asteroid size from the observed brightness. Various other observations also helped pin down the asteroid size and Ryugu was estimated to have a diameter of about 900 m, with an albedo (reflectance) of around 0.05. The scale for albedo corresponds to 0 for not reflecting any light at all through to 1 for all light being reflected. An albedo of 0.05 therefore corresponds to just 5% of light being reflected, making this a pretty dark asteroid. 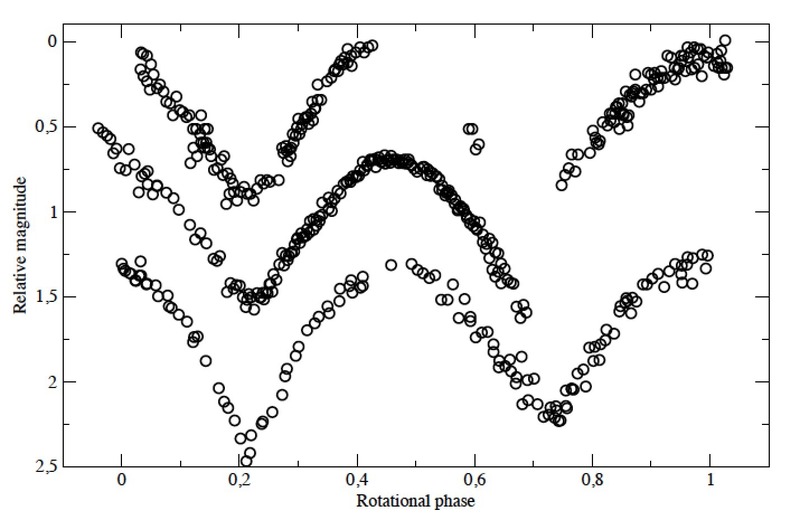 Many observations have been carried out since Ryugu became a prospective candidate to be visited by Hayabusa2, and many light curves have been constructed. This allows us to estimate the asteroid's rotation period (time for one rotation) and shape. Examples of the light curves of Ryugu is shown below. The vertical axis is the relative brightness and the horizontal axis is the rotation phase. 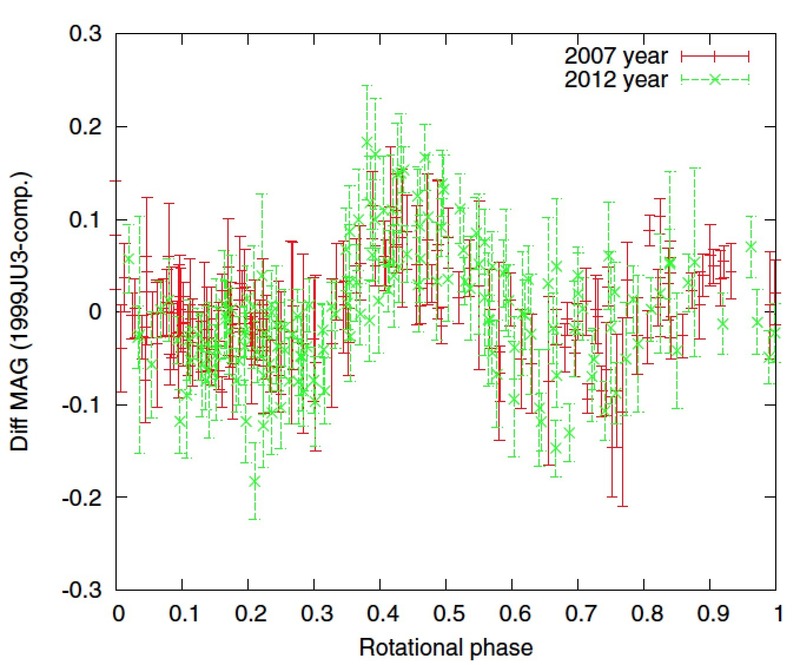 The phase of rotation corresponds to one complete rotation and the measurements overlap every 7.6275 hours. The vertical bars attached to each point show the error range (uncertainty in the measured value). Comparing the figure above to the light curve from Itokawa in the first figure in this article, you can see that the amount of change in brightness of Ryugu is very small. From this, we believe that the shape of Ryugu is not long, but more spherical. The shape was visualised from the shape estimation data by T. Müller (2014). For comparison, the approximate size of the Tokyo Sky Tree, Itokawa and the Tokyo Tower are also shown (running left to right). The spherical shape of Ryugu looks a little like a dumpling! For Itokawa, we were able to confirm the shape by radar observations before Hayabusa arrived. This was not possible for Ryugu as the asteroid has not passed close enough to the Earth for radar observations since its discovery. In February 2008, Ryugu was 0.16 astronomical units (24 million km) from the Earth, but this was too far for radar observations. In December 2020, Ryugu will pass the Earth at a distance of 0.06 astronomical units (9 million km), but this is right around the time that Hayabusa2 will be returning from the asteroid to Earth! From the light curve of the asteroid, the rotation period (time for one rotation) of Ryugu can be obtained quite accurately. The asteroid rotates every 7.6275 hours or about once every 7 hours and 38 minutes. However, estimating the orientation of this rotation (the direction of the rotation axis) is very difficult. For Itokawa, the shape was long and thin, which made it easy to estimate the direction of the rotation axis. 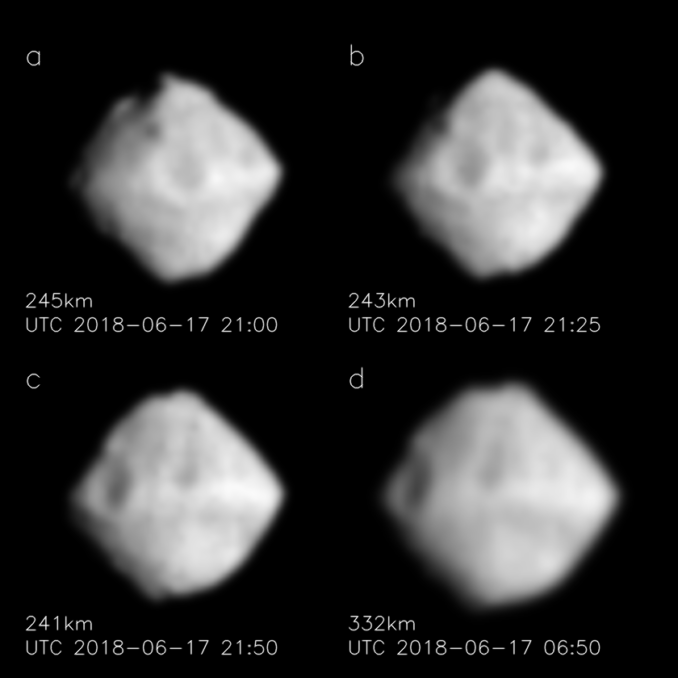 But since Ryugu is close to spherical, it is difficult to tell which way the asteroid is spinning. Unfortunately, there are no radar observations to help us. In the shape estimate shown in Figure 11, we estimate the direction of the rotation axis to be 340 degrees ecliptic longitude and -40 degrees ecliptic latitude. The ecliptic longitude and latitude are values in the "ecliptic coordinate system". We'll skip over a detailed explanation here, but the numbers are very similar to the longitude and latitude on the globe. The equator of the globe corresponds to the orbital plane of the Earth around the Sun, which has an ecliptic latitude of 0. Ryugu's rotation axis is estimated to have an ecliptic latitude of -40 degrees, and that gives us some problems. If the ecliptic latitude is close to 90 or -90, then the axis of the asteroid's rotation would be perpendicular to the orbital plane. Hayabusa and Hayabusa2 have a view along the orbital plane, allowing the spacecraft to see most of the asteroid surface as it rotates. This orientation is therefore easiest for observing the asteroid. Itokawa has a rotation axis angle at nearly -90 degrees, which made it very easy to explore. However, if Ryugu's rotation axis is truly tilted at -40 degrees, then Hayabusa2 will only see part of the asteroid surface as it rotates. It is like looking down on a spinning top, rather than viewing it from the side. In this case, it will be necessary to carefully device a schedule for observing the asteroid. Since it is possible that the value for the orientation of Ryugu's rotation axis is not correct, Hayabusa2 will first approach the asteroid and observe its rotation. From this, the direction of the rotation axis can be estimated far more accurately. Depending on the resulting orientation measurement, it is possible that the current schedule for the subsequent mission will change drastically. There are several reasons why Ryugu (then 1999 JU3) was chosen as the destination for Hayabusa2. The first was that the orbit of the asteroid was suitable to allow the spacecraft to visit and return to Earth. The second reason was that Ryugu is a C-type asteroid. I would like to explain about spectra here, but the description would become very long! So I am going to stop by simply stating that the spectrum of the asteroid (the different wavelengths of light coming from the asteroid) told us Ryugu was a C-type asteroid. C-type asteroids are thought to be parent bodies of the meteorites (that fall to Earth from space) called "carbonaceous chondrites". These are thought to contain organic matter and water. Exploring such early elements is the science focus for Hayabusa2, so the C-type asteroid Ryugu was an excellent destination choice. "Ryugu is an asteroid with an approximately spherical shape and size (diameter) of about 900 m, with a black-ish surface (low reflectance). It is a C-type asteroid that rotates every 7.5 hours." Can you imagine Ryugu with this description? Perhaps you can imagine an asteroid closer to what Ryugu will truly look like by not being restricted to the information written here. It is a challenge for your imagination! OSIRIS-REx is a US asteroid sample return mission that will arrive at asteroid Bennu (101955 Bennu) after the summer of 2018. Since radar observations were possible for Bennu, its shape is well understood (see figure below). It is about 490 m in diameter and rotates every 4.3 hours. In addition, the rotation axis is almost perpendicular to the ecliptic plane.